Atslow, Edward (Attislow), fellow New Coll. 1551-62, from Eversholt, Beds, B.A 26 June, 1555, M.A 30 May, 1559, B.Med. (sup. 12 April) 1564, created D.Med. 27 Aug., 1566, fellow College of Physicians, imprisoned for designing the escape of Mary Queen of Scots, physician to the Duke of Norfolk, and racked in the Tower on his account, died in 1594. See Munk’s Roll., L 67 ; Gutch, ii. 144 ; & Fasti, i. 176. Atslowe, Luke, fellow of New Coll. 1556-8, from Eversholt, Beds, B.A. 24 Jan., 1559-60, M.A. 19 Feb., 1564-5, removed from his fellowship because he would not take holy orders according to the statute. See Gutch., ii. 145 ; & O.H.S., i. 241.
Who were these troublesome people? Catholics, presumably, since Mary Queen of Scots and the Duke of Norfolk were catholic. They definitely suffered for their faith. Presumably, they were brothers. Edward and Luke Atslow are mentioned all over the web in articles about Elizabeth and Mary and catholicism. Somebody should really do a decent bit of research on them – at least a wikipedia article! But, in the absence of anyone with both the time and the inclination, here’s just one gory bit. Edward Atslow, M.D. 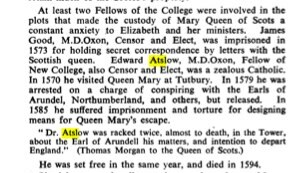 Oxon, Fellow of New College, also Censor and Elect, was a zealous catholic. In 1570 he visited Queen Mary at Tutbury. In 1579 he was arrested on a charge of conspiring with the Earls of Arundel, Northumberland, and others, but released. In 1585 he suffered imprisonment and torture for designing means for Queen Mary’s escape. “Dr. Astlow was racked twice, almost to death, in the Tower, about the Earl of Arundell his masters, and intention to depart England.” (Thomas Morgan to the Queen of Scots.) He was set free in the same year, and died in 1594. Oh, shucks, I just found he has not only a wikipedia entry but also an entry in the Dictionary of National Biography. But where did he come from in Eversholt? Edward Atslowe, M.D., [from Eversholt, Beds.] was educated at Winchester and New College, Oxford. Being then M.A. and fellow of his college, he was, on the 22nd August, 1554 [or 1564], actually created doctor of physic, in the house of Dr. Henry Baylie, situated in the High Street, leading to the Quadrivium, by Dr. Thomas Francis and him, the said Dr. Henry Baylie, by virtue of a commission directed to them by the venerable convocation. He was one of four (three of whom were doctors of medicine) thus created, because appointed by the Convocation to dispute before Queen Elizabeth, when she came to be entertained by the academicians in the beginning of September of this year. (1) The date of Dr. Atslowe’s admission as a Fellow of the College of Physicians is not recorded, but it must have been at some period between 1565 and 1569. (2) He was Censor in 1569, 1570, 1571; Elect, 12th November, 1572; and Consiliarius, 1572, 1583. Dr. Atslowe, who was married at Stoke Newington, on the 2nd November, 1573, to Frances Wingfield, was dead 28th May, 1594, [He was buried at St James Clerkenwell “1594 Apr 26 Mr Doctor Atslowe in the chancel.”] when his place of Elect was supplied by the election of Dr. Christopher Johnson, another distinguished Wykehamist. The Essex Archives, of all places, have this, which suggests he really did come from Eversholt and his father was William Atslow. PETRE FAMILY OF INGATESTONE AND WEST HORNDON. Luke and Edward even get into a row over some trees! In detail more gory than I could manage to wade through here. And Edward inherited a cow! Good grief! This is the google cache of http://www.google.co.uk/url?sa=t&rct=j&q=william%20atslow%20eversholt&source=web&cd=3&ved=0CC4QFjAC&url=http%3A%2F%2Fblars.adlibsoft.com%2Fwwwopac.exe%3FDATABASE%3Dcatalo%253Eitems%26LANGUAGE%3D0%26DEBUG%3D0%26BRIEFADAPL%3D..%2Fweb%2Fadapls%2Fwwwreq%26DETAILADAPL%3D..%2Fweb%2Fadapls%2Fwwwreq%26%25250%3D400089431%26LIMIT%3D0&ei=74nBTrTmAYbW8QODi9WbBA&usg=AFQjCNF2T8G_FOBjkOIZUnEwbxRaiKmbvg because the link has stopped working. Or maybe the computer just got too bored. Agnes Rudde of Eversolt, made 20 Oct. 1540, pr. 12 Jan. 1540/1. “Furst I bequeth my soull to my savyour Jesu Criste”. Burial in the church yard of Eversholte at the middle of the chancel end. To the mother church of the diocese of Lincoln 3d. To her god-daughters Jane, Dorothe, Francys, Crastyan, Agnes and Katering (the daughters of testator’s cousin William At Slow and his wife Anne) are each to have a mattress, a bolster, 2 pair of sheets, 2 pillows, 2 pillow beres, 2 coverlets of 2 sorts, one pair of blankets, one brass pot, one skimmer, one ladle, one table cloth, one towel, one silver spoon, one cushion, 2 platters, 2 pewter dishes, 2 saucers of the common sort, one candlestick, one pewter basin, one latten basin. Dorothe is to have in addition a gold ring, and Francys is to have testator’s hutch. If there are not sufficient brass pots, then they shall have instead a little pot or a posnet. To Edward At Slow, one of William and Anne’s sons, testator’s cow. Residue to the same William and Anne, who are her executors. Witnesses: Roger Marshall clerk, Thomas Jonson and others. Administration was granted to William Atslow, reserving the power of the Rector of Eversolde to accept the oath of Anne, the other executor. Edward Atslow was admitted to the university to study for a Bachelor of Arts degree on 26 June 1555 (all dates here Julian). He “determined”, determined the result of some debates rather than just debating himself, from 1556. He was “licensed” for a Master of Arts degree – admitted to study for, I think – on 30 May 1559, 4 years after arriving. He “incepted” – became a Master of Arts – on 19 February 1559, 9 months later in the Julian calendar. He finally disputed – took an oral exam? – for his MA on 27 March 1560, 6 weeks later. He “sup.” (?) for a Bachelor of Medicine degree on 12 April 1564, and “sup.” for a Doctor of Medicine degree on 10 March 1565. On 5 August 1566, he applied for permission to be formally awarded the degree of Doctor of Medicine despite the fact that he was away. He was made a Fellow of New College according to the Fasti list of scholars.